Bobby K. Marks, who was named president emeritus of Sam Houston State University upon his retirement in August 2001 as the university's 11th president, will be the speaker for fall commencement exercises Dec. 18. Ceremonies are scheduled in Johnson Coliseum at 10 a.m. for the Colleges of Business Administration and Education, and 2 p.m. for the Colleges of Arts and Sciences, Criminal Justice, and Humanities and Social Sciences. The SHSU Registrar's Office said that 1,121 students have applied for degrees, including 13 who are expected to receive doctorates. Marks came to Sam Houston State Teachers College in 1960 as an instructor of management. 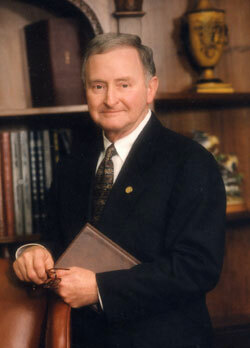 He became president in June 1996, after serving eight months as interim president. Before his appointment as interim president, he served 11 years as a vice president in the areas of academic affairs and student services, and prior to that, 15 years as an academic dean. His service to Sam Houston State was interrupted twice--in 1963-'64 when he was an instructor of business administration at the University of Arkansas and in 1972 when he was a professor in that university's European Masters Program in Turkey and England. While president, Marks focused his efforts on increasing the use of technology for instructional programs, student retention, fund-raising and international activities. The esteem in which he was held was indicated by the designation of a street on the university campus as Bobby K. Marks Drive and naming a building, the Bobby K. Marks Administration Building, in his honor. Marks served on numerous Texas Higher Education Coordinating Board advisory committees and as a consultant to individual and private industry groups. He was on executive boards of the Texas Council of Public University Chancellors and Presidents, Association of Texas Colleges and Universities and the Texas International Education Consortium. Regional service included the Association of Chief Academic Officers of the Southern States, with service since 1991 on the executive council, as vice president in 1994, and as president in 1995. He was also active in community service, holding key positions in the Huntsville/Walker County Chamber of Commerce including serving as president and chairman of the board in 1990. Among the many other community groups with which he worked were the Economic Development Corporation, Huntsville Leadership Institute, Walker County United Fund, City of Huntsville Planning Commission, and Walker County Industrial Development Corporation. He also had a number of publications and textbook reviews on such subjects as university structure and teacher education organization, enrollment management, cost containment, and management principles.